The folk adage, “an apple a day keeps the doctor away,” is not only a simple rule for good health but a tip for delicious dining. 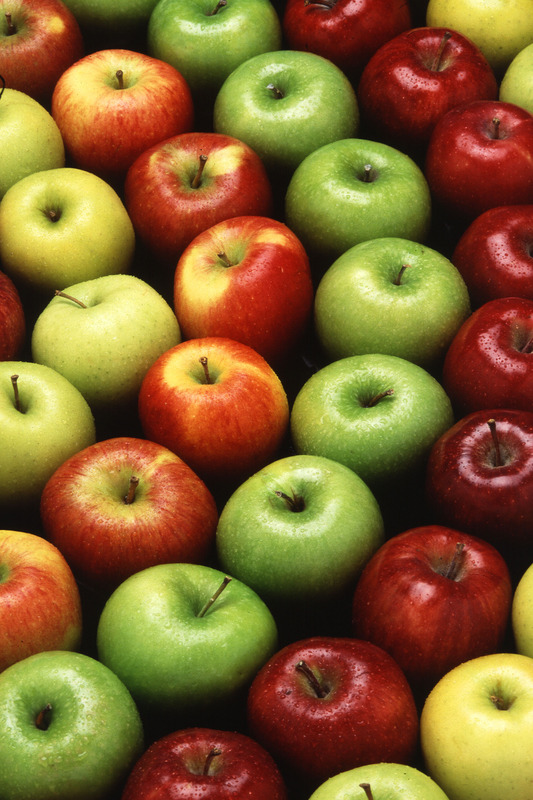 Apples are grown on every continent and are the fruit of a Eurasian tree, the Malus pumila. An aromatic treat to be enjoyed throughout the year. Place all ingredients but arrowroot powder in a 2-quart pot with lid. Bring contents to boil, reduce heat, cover, and simmer for 40 minutes. Stir occasionally. If desired, thicken juice with arrowroot powder, then bring to a final boil and remove from heat at once. Let stand at least 15 minutes. Serve hot or cold. Enjoy this unique apple syrup served over fresh fruit or cooked rice. In a 1-quart pan simmer apple juice with all the ingredients, except arrowroot powder and bananas until liquid is reduced by half (about 30 minutes). Remove pan from stove and discard orange and apple halves. Stir in arrowroot powder, return pot to burner and bring to a final boil. Remove syrup from heat at once and let stand 15 minutes longer. Peel bananas and slice them. Divide sliced bananas into four individual bowls. Pour syrup over bananas and serve. A dessert in which sweetness and healthy indulgence meet. 4 large baking apples 2 Tablespoons lemon juice 1 cup apple juice (about) 1/3 cup dried currants 1/2 cup pure maple syrup Large pinch ground cloves Large pinch ground cinnamon Preheat oven to 375 degrees. Core apples, remove seeds, peel away a bit of skin, and stuff with currants. Set in oven-proof baking dish. Combine lemon and apple juice with spices and maple syrup and pour over apples. Bake uncovered for about 45 minutes, basting often. Serve warm. A recipe from my Swiss grand-mother’s kitchen. Great for brunch. Pretty, tasty, easy, and healthy! Dissolve rice syrup into pineapple juice; then combine all ingredients but the strawberries in a bowl. Let stand for a few minutes, mix again. Set fruit mixture in individual dishes, garnish with berries. Serve at once. This soup is absolutely delicious. 20 dried, unsweetened apple rounds or slices 12 large dried apricots, pitted 1/2 cup raisins or dried currants 2 cups apple juice 1 Tablespoon of grated orange peel 1 Tablespoon grated lemon peel 1 cloth packet with a stick of cinnamon and a few cloves Mix all ingredients thoroughly in a 3-quart pot. Simmer uncovered for the better part of an hour, stirring often. Add more juice if necessary and discard spice packet at end of cooking time. Serve warm or chilled. Keeps for days in the refrigerator.